A dustcover endorsement proclaims that the author, Patrick K. O’Donnell, is “one of the world’s preeminent military historians.” What makes him so is the fact that many of the topics on which he writes involve the story behind the story. His previous works have recounted events and details of history which rarely, if ever, get into the history books. As a rule, one must go looking for these for oneself or perhaps hope that O’Donnell gets around to writing about them at some point. 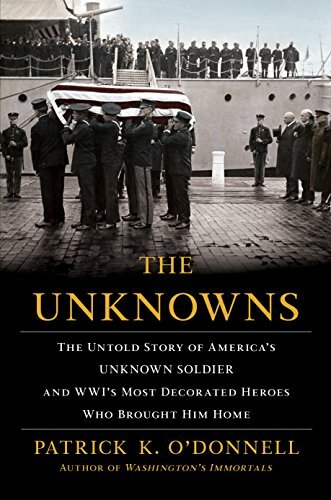 In this case, it is the story of not just how the United States came to honor one of its own unknowns, as other countries had previously in their wars, but also recounts the experiences of those highly decorated soldiers who were ultimately Body Bearers and the one man who made the selection of the remains that would represent all American unknowns and those, certainly, who made the ultimate sacrifice. The text tells the story of each of these men, the famous battles (St. Mihiel, Belleau Wood, etc.) in which they participated, decorations earned, and simply how they came to be designated as Body Bearers as a result of their service by their commanding general. With the centennial of America’s participation in World War I ongoing, this is a highly relevant publication inasmuch as most Americans are probably unaware of the process by which one man was selected to represent those who made the ultimate sacrifice and whose tomb at Arlington national Cemetery is currently one of the most visited places of the American landscape. The eight Body Bearers were, for the most part, a microcosm of America. They represented each of the country’s military services and also different civilian walks of life, included two Medal of Honor recipients among other significant decorations and, although no African American soldier was designated, there was a Native American of the Cheyenne tribe. The man who made the selection was twice wounded in combat and assumed the responsibility upon orders from General John J. (Black Jack) Pershing. His choice followed the arrangements made by the army to prevent identification of any of the remains disinterred from military cemeteries in France, going so far as to switch the order of the caskets and remains within caskets in order to preclude the possibility of identification. It should not be surprising but Sgt. Edward F. Younger, who made the selection, was overwhelmed by the responsibility and wondered, as any man would, whether the unknown was a friend of his or perhaps might have saved his life in combat. Feeling the hand of God guiding his choice, he placed a handful of white roses on the casket to which he felt directed. With the respect, honor, and the highest medals that could be awarded from representatives of America’s Allies, America’s Unknown became the most highly decorated American serviceman and his remains were transported to Washington, D.C., for interment in the tomb now so widely recognized and which is guarded night and day by members of The Old Guard, 3rd United States Infantry. Our modern DNA identification techniques have now made it nearly impossible not to identify any service members killed in action and chances are there will be no such further designations although unknowns from Korea and Vietnam joined the original in more recent years. As well told as is this story, it is also complemented by excellent and helpful maps that provide context and show where each man served in France along with the overall military operations. The photographic section includes many relevant black and white photos and illustrations as well as two color shots of the Tomb today. The Epilogue updates the post war lives of each man in addition to other dramatis personae referenced in the text. As with many of our veterans today, these men didn’t always get over what they had seen and experienced and not a few suffered from what we now know as PTSD. Finally, the style in which this is written ultimately conveys the reverence and honor which is deserved from the citizens of this nation to all of those who go in harm’s way to protect us and guarantee our rights and freedoms. Clichéd as it may be, we should never forget that freedom isn’t free and never will be.